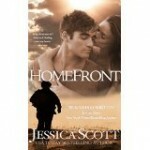 Lest we lose sight of her latest book, here’s a reminder about Homefront, available APril 7th. I was in Iraq five years ago. It’s amazing how fast that time has flown by. It sometimes feels like I just came home. Other times, it feels like it’s been a lifetime or more. There are lots of memories from that year. Many deeply embedded that I hope I will never forget. The people. The smells. The dust and the dirt. One memory that stands out is how Jane wrote to me. Pretty much once a week or more I’d get an email from Jane telling me about her day, her cats or what she and George had gotten into. Her notes were a small slice of normalcy for me that year. Along with notes from Jane, my home chapter of the Austin RWA sent me care packages that they collected up at every single monthly meeting. Something as simple as bottles of shampoo that could make you feel like a woman for a brief shower. Or CDs of new music to remind you that there was an entire year passing you buy back home. I don’t have the shampoo. And the CDs have long since been burned onto playlists that I still listen to, especially when I’m writing and need to access those memories. But I still have Jane’s emails. They’re all in a folder on my computer – the same computer I’ve had since that tour. I haven’t reread them but I’m planning to print them out someday and put them in a folder along with letters I wrote to my husband and letters I received from other people during the war. Because those letters that Jane wrote kept me connected to life back home. They were such a simple thing but they reminded me that not everyone back home was going about their daily lives, ignoring the war. When I came home from Iraq, Jane sent me and my family a patriotic bear. It was her way of throwing us a parade. It’s gestures like that – simple little things – that make such a big difference in the grand scheme of things. So Jane, thank you for being there for me. Thank you for writing, for arguing with me when I stepped in it and for being such a dear friend through a particularly rough time in my life. I’m thrilled to death to announce that the marvelous Jessica Scott will be guest blogging HERE tomorrow. She’s a dear friend, a great writer, and so much more. Jess has a new book that’s just out so I asked her to blog. She graciously accepted. Homefront was out April 7. Seven or eight years ago, Jessica Scott joined the Austin chapter of Romance Writers of America even before she arrived in Austin. An active-duty officers, as she and her family were moving to Fort Hood, she posted to our loop so we all got to know her before she attended a meeting. I didn’t know this at the time, but that’s Jess. She takes charge. She does what she needs to do. She goes straight ahead and I admire her greatly for that. Jess knew she wanted to write novels about her Army family. She set that goal and worked hard and look where she is now: twice a USA Today bestselling author with eleven published novels; wife of a retired NCO, mother of two, and manager of a zoo-full of pets and–again–so much more. Here’s her biography from amazon.com Jessica Scott has written for the New York Times At War blog, War on the Rocks, PBS Point of View Women and War and has been featured in Esquire Magazine as an American of the Year in 2012. She has published 11 novels and novellas about soldiers returning from war and has hit the USA Today Bestseller list twice. She has compiled two nonfiction projects about her time in Iraq and the return home. She has recently completed a master’s Degree in sociology from Duke, Masters Degree in Telecom Management from University of Maryland University College, BA in Cultural Studies from State University of New York. My dear and very talented friend JESSICA SCOTT has a new book–BACK TO YOU– coming out tomorrow. I’m participating in the pre-launch blitz for that book. If you haven’t read her novels, you can look forward to a great read. She’s in the Army and, in my opinion, is the finest author of military fiction writing today. Below is an interview with her sent to me by her publisher, Hachette, which is also my publisher but in a different imprint. You first introduced Trent and Laura a few years ago and readers have been eagerly awaiting their story for a few years. Did you always know when you first created them in BECAUSE OF YOU that this was how their story would play out? BACK TO YOU is the incredibly emotional story of a marriage at the breaking point. What or who inspired you to write this story? In your own personal life, you’ve been the soldier that has deployed to a war zone and the spouse that stayed home and has taken care of the family on the home front. Which was more difficult for you in your experience? And why? Which is your favorite story to write—a reunion romances like Trent and Laura’s where each scene is alive with their own history or a fresh romance where they meet for the very first time and everything is new? Why? Trent is such a compelling character and you do a beautiful job of showing his survivor’s guilt and the resulting anxiety and fear that provokes in him. He’s both so alpha and strong and so very broken. What inspired you to create such a complicated hero? A real life person? A culmination of your own experiences? What you’ve seen yourself in the army? And were you at all concerned about the way readers would respond to him? Laura is such an amazing character because she’s done the best for her family at every turn and supported her husband. But when all communication breaks down with her husband and he just keeps deploying, she serves her husband with divorce papers while he’s serving. It seems like such a taboo to serve papers while your spouse is deployed—is that true? And why did you choose to have Laura, the ultimate good wife, respond this way? Agent Chaos and Fluffy, the family hamsters, almost steal the show with their disappearing acts and they add the perfect amount of cuteness and comic relief. What inspired you to add them into the story? Big wedding or small? Hamsters or dogs? Sweats or lingerie? Emma and Ethan, Trent and Laura’s kids, are adorable and watching Trent learn how to be a dad again is an amazing thing. How do you think Trent got so detached from his family? Since this is such an emotionally charged story, was it difficult for you to write? Or did it come easily? Since you’ve been in Trent’s shoes, what is the hardest thing about readjusting to civilian life after a deployment?